The expansive windows of Gallery One have been blacked out with long, dark curtains. Spot-lighting of individual artworks further conspires to create a theatrical atmosphere. Despite the fact that Helen Hughes specifically describes her work as ultra-modern and largely unconcerned with history, it is difficult to read her artworks explicitly in this way. For me, they inhabit a much more ambiguous timeframe. A Bold Complement (2017) is a long and flowing swathe of acrid green cellophane which glistens in the dimly-lit alcove. It could easily be admired for its ultra-modern, tactile plasticity, in the way one might marvel at shrink-wrapped meat, in all its compressed, synthetic glory. Yet something about the encounter calls to mind medieval silk cloaks, pagan shrouds or some other garment retaining the history of its own performance. At the side of the arch, non-descript sculptural bundles hang ominously, like the superstitious Irish piseogs, frequently tacked to doors and land boundaries to ward against misfortune. Some of the smaller works presented also appear to fluctuate between time-zones. Whilst the slick materiality of Double your Breathing Capacity (2017) is unequivocally modern, even futuristic, its objecthood seems to hark back to the past, as if in search for a more suitable language to anchor it. The dual sculptures’ ultra-glossy resin veneer coolly exudes a 1970s aura of gaudy ornaments and patterned glassware. The grey piece is spliced with cerise lines which ripple and dart across its surface, while its counterpart takes on a conch-like form, its buckled, unfurling ivory surfaces retaining the shape of some recently-departed crustacean. This fleeting reference to organic matter ventures closer towards the artists’ intentions for the work, with signage indicating that these pieces “will degrade over time”. In an otherwise static presentation, movement is generated by Stronger than Dirt (2016) – a kinetic piece fabricated in sherbet lemon yellow cellophane that rotates as gently as a lackadaisical windmill. Rather than using traditional gallery plinths, the artist has fabricated simple Ikea-esque plywood tables – a form of display perhaps more closely associated with boutique interiors. This presentation strategy finally discloses the artists’ earnest obsession: the seductive surfaces of retail. Borrowing inspiration from mass-produced consumer goods and dispensable packaging, Hughes manipulates industrially-manufactured materials in a range of synthetic colours, smuggling functionless, wonderfully fetishistic objects into the gallery setting. Two paintings by recent NCAD graduate Jane Rainey are also presented in Gallery One. The small canvas Curator Aquarium (2016) sinks comfortably to the bottom of the wall in a gesture that seems to emphasis the lightweight qualities of the nearby Buoyant (2016). This painting is larger in scale and is cleverly divided into two zones of colour by the slight of a slow arc – a compositional device that not only echoes the space’s architectural features, but also channels an inescapable sense of orientalism. Whether deliberate or unconscious, this eastern influence permeates many of Rainey’s other paintings displayed in Gallery Two. Here, the formal devices of asymmetry, pattern and flattened perspective conjure fantastical, technicoloured landscapes that are dotted with displaced elements (such as spindly branches, uprooted trees and fan-like shapes suggestive of flowers or clouds) and riven in a battle between land and sky. The works are neither fully figurative nor abstract, chaotic nor ordered, and display a vigorous pursuit of paint to the edges of the medium’s parameters. 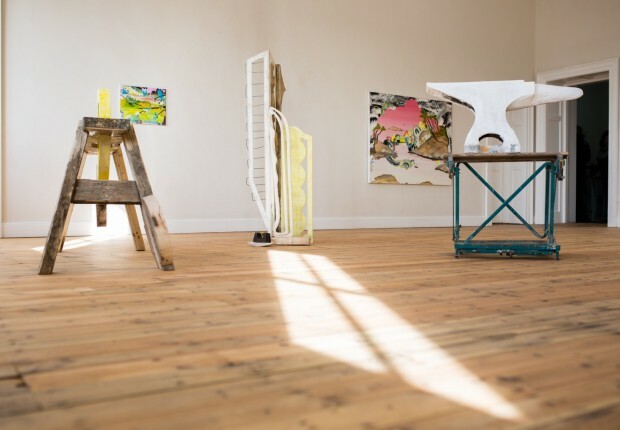 Fresh wooden floors in Gallery Two create the perfect aroma for viewing an intimate gathering of mixed-media works by John O’ Kane, a recent graduate of Sligo IT Art Department. Using a sculptural assemblage approach, O’Kane has salvaged bits of old furniture and other found objects to create three artworks that could easily constitute a triptych. There appears to be continuity and an ‘all-overness’ to these pieces, as if they were worked on simultaneously. It is obvious that an engineering mind is at work, which relishes the challenge of actively piecing components together. Arguably, these works could be best described as three-dimensional collages, reminiscent of Cubist bricolage. In architecture, bricolage refers to the entangled effect of viewing buildings from different architectural periods and styles in close proximity to one another. It was a term widely applied to the architect Le Corbusier, who assembled ideas and objects gleaned from architecture’s long historical trajectory. Some of O’Kane’s mismatched surfaces retain traces of their past lives – evident in scuffs, scores and fading varnish – while others have had their history marks sanded away or covered over with fresh layers of paint. Occasional glimpses of former functionality are also offered, such as a table leg which has abandoned its traditional supporting role to take on new meaning as an unanchored, hanging feature within a vertical sculptural. The weightier Anvil. Bearing the Weight (2016), channels the historical values and craftsmanship of industry. In the context of Gallery Two, O’Kane’s solid and seemingly immovable sculptures provide stoic counterparts to Rainey’s bustling paintings. Further interactions between the work of these two artists are tantalisingly tested in the dark, cavernous confines of Gallery Three. Here, the light, the air, even the sound, feels different. Rainey’s perfectly composed canvas Making and Unmaking (2016) depicts an otherworldly settlement situated high upon an enchanting rainbow mountain. On a long, low plinth, O’Kane presents Colony (2016), a wooden cityscape, as craggy as the sea-worn rocks of Skellig Michael, which has the sensibility of bone, ivory or ancient stone. The central plinth has the proportions of a sarcophagus, while the spot-lit space feels sombre and somewhat insulated from the world outside, not unlike the interior of a mausoleum. It calls to mind the consumer optimism of 1950s America and a trend for interring the deceased dead above ground in ostentatious vaults, rather than burying them underground. Such resting places were enshrined chambers; portals suspended between the subterranean and the heavenly. Back in Gallery Two, Felicity Clear’s site-specific sculptural installation, Unconscious Proposal (2017), hangs in the balance. Stacks of wooden sticks on the verge of collapse become exponentially more precarious as they ascend in a seemingly unsustainable curve, climbing the gallery wall like ivy. This is the tallest Gallery Three has ever felt. I have never seen ‘shadows’ included in lists of artwork materials before, but in this instance, such detail works exceptionally well. Shadows are in fact an indispensable component of this sculpture. They extend the piece beyond its original dimensions across surrounding surfaces, lightly infusing it with an aura, like the ghostly projections of an ancient relic, or the last vestiges of a fallen empire. The sculpture sits alongside Possibility only in the Impossible (2016), a large-scale drawing on paper that echoes the sculpture’s composition and structure. The work is exquisitely rendered in different shades of graphite, which create dialogue with the sculpture’s solid and shadowy rods. For the artist, drawing is both a cognitive process (where she can work through spatial and temporal ideas) and an open-ended proposition, where failure is always a distinct possibility but a risk worth taking. Both artworks feel like responses to the urban environment. Their interaction creates vibrant mark-making, with each structural cluster seeming to hum at a different frequency. At the top of the stairs, Richard Forrest’s wall-based graphic piece also seems to reference the built environment, with an architectural-style 3D image rendered in vinyl transfer. Forrest uses digital technology to extend his sculptural practice, combining the physicality of constructed objects with dizzying patterns associated with the virtual realm. Forrest utilises digital tools including 3D printing and Blender – an open source 3D creation software frequently used in animation, architectural rendering and game creation. However, his interest in technological mishaps or ‘glitches’ is arguably the defining feature of his work. Forrest trawls visual culture history for pre-digital ‘artefacts’ that manifest the meaning of glitch, a term that can variously denote: viruses within operating systems; security breaches; sudden breaks in function or continuity; temporary losses of service within a network. One example is the TV transmission Test Card – a static image for calibrating television sets – which was widely broadcast during the 1980’s at times when transmitters were inactive or programming had ceased. Another significant strand of inquiry in Forrest’s work relates to the ‘simulacrum’ – a term denoting an image, representation or imitation of something (or someone). More specifically, a simulacrum is a copy of something that displays none of the original’s substance or authentic qualities. Over the last 40 years, the term has gained immense philosophical traction, with theoretical contributions from key thinkers including Frederic Jameson, Gilles Deleuze and Alain Badiou. As argued by French Postmodern theorist Jean Baudrillard in his 1976 book Symbolic Exchange and Death, a simulacrum is not a copy of the real, rather it is truth in its own right, becoming what he calls the ‘terminal stage’ of simulation: the ‘hyperreal’. For Baudrillard, the hyperreal is a system of simulation that is now perpetually simulating itself. ‘A Bounce Borrowed’ forms part of a series of exhibitions aimed at bringing together artists at varying stages of their artistic careers. This group show presents artworks by recent graduates, several of whom are already gaining national recognition for their achievements as emerging artists. It was originally developed as a platform to explore the fresh and playful dynamics an exhibition like this can generate, while activating dialogue between artists, artworks and audiences. However, such nuanced interactions do not happen by chance. They are the product of in-depth curatorial research, prompted by some initial encounter, but augmented through cognitive logging and appraisal of artworks, in a detailed phase of groundwork that will ultimately introduce these works to one another.